I know there are many recipes out there for Arroz con Pollo (Rice with Chicken), it does happen to be a very popular dish. I love it. Just two years ago I was given the wonderful gift of Dream Dinners after our son was born. It was a miracle, a life-saver, and I don't think I've ever fully thanked our friends enough for the wonderful gift. 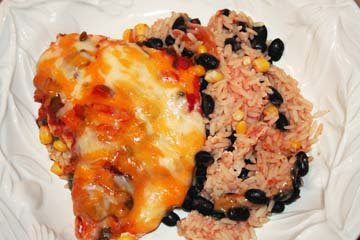 One of those meals was Arroz con Pollo, and since then I have craved it, dreamed of it, and even tried my own hand at it: Mexican Cheesy Chicken and Rice Recipe. While that was yummy (alright, I confess, I love it too), this recipe is to die for! discovering the fact that one of my favorite all time recipes is in the book - I will sing it's praises. Alright, I'll let you know how I like the other recipes. Can I tell you one last thing before I share this recipe? Good: It's dairy free if you omit the cheese topping. And it is just as easily gluten free if you purchase the right products, which for this recipe isn't hard. Spray 9x13-inch baking dish with nonstick cooking spray. Prepare the rice according to package directions. Spread the rice over the bottom of the prepared baking dish. Layer the beans, corn, and chicken over the rice and sprinkle with the salt and pepper. Set aside. In a large bowl combine the rest of the ingredients minus the cheese. Pour the mixture over the chicken. Sprinkle with cheese. For dinner tonight... Preheat the oven to 350 F (175C). Bake for 45 minutes to 1 hour, until the internal temperature of the chicken breasts reaches 165F. Tomorrow the left-overs are going to be cut up, warmed up and wrapped inside a soft tortilla with avocado, sour cream, cheddar cheese and a squirt of lime. Oh so divine!